The Hilton has upgraded its mattresses and linens. I would guess that they are at least 600-count. The beds are the new "comfort" beds and, all-in-all, it was tough to wake up in the morning. It had nothing to do with the beers from the night before. It was too late for breakfast, but Eddies Sports Bar in the hotel had a nacho offering that had to be at least 5 pounds of chips, lettuce, cheese, and chile. As much of a nacho fiend as I am, I could bare make it halfway through the plate. They also had a beer sampler that gave me three terrific brews. We decided to get a jump on things and go to Opryland early. The cab driver was a hoot. Heavy accent and good-ole-boy stories about Nashville. We got our tickets at will call and decided to take a gander at Opry Mills, the mall behind the hotel. It was pretty crowded, probably back-to-shool shoppers I figured. We walked all over Opryland, paused for gelato in the conservatory, and killed some time in Rusty's Sports Bar and Grill. It hasn't changed since my trip here 5 years ago. The Opry was okay. We got there and I hit the concession. Had a great hot dog for only $2.50! Our seats were pretty good and were only about 20 feet from the stage, so we had a decent view. The only problem at all was that, just before the show started, a bunch of flying bugs found their way to our part of the audience. I kept fending them off for about an hour. The entertainers were pretty good and, even though not a big country fan, I enjoyed it. I have to say that the GooGoo commercials were really getting to me. I wasn't the only one either. The people behind us had too much as well. I think the final straw was when they had one commercial break that said, "on a Saturday night, there's nothing that satisifies me like a GooGoo". Back to the hotel to rest up for Sunday. Broadway in Nashville is the real party street. 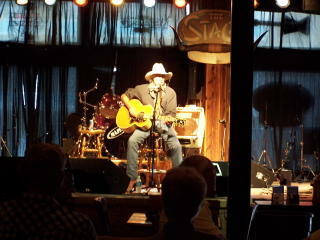 With several "honky tonk" bars with no cover and usually decent acts, the fair beer prices make it even better. We grabbed dinner at Jacks BarBQ. After that, we started around 8:00 at Roberts Western Wear where a pretty good band was working. They played classics and current pieces and the crowd was really into them, complete with dancing. After an hour or so, we were on to The Second Fiddle where there was a very young band from California. They were okay and we did enjoy their more up-to-date music. They had trouble drawing a crowd though. I think it had a lot to do with their dress. People here are looking for country, while these guys had on Metallica shirts, leather pants, and looked more like a rock band. Despite being a Friday night, there were barely 20 people in the joint. After a few beverages (ahem) we went on to Tootsies. This was a great and very busy place. We managed to score a table on the first floor pretty quickly and there are music venues on both levels. We hit them during the switch in acts so there was about 15 minutes or so with no music going on and, while busy, it wasn't too bad. At 10:00 it suddenly got so crowded that you couldn't even move and then stayed that way the rest of the time we were there. I did discover that any single guy looking to meet women should be on the stool I was sitting on. Its located near the stairs and everyone has to pass it going between levels. And, since the restrooms were on the 1st level, that created even more traffic. So many women passed by and pressed against me, several being very obvious about it, that I completely lost track. One that had obviously been there a while was a lot more brazen and direct. Another one, shortly afterwards, had her hands everywhere as she squeezed by. I thought it was nothing -- a mistake -- until she passed again on her way back upstairs and did it again. I won't repeat the several things whispered in my ear throughout the hour or so -- and all of this while I am sitting there with my wife! Pretty cool I thought! It may be normal in clubs today, but I sure am not used to it and it took me a little by surprise. Why me? Actually, I think that any guy sitting there would have gotten the same treatment. The band, and lead singer in particular, was great and we only left out of frustration with the very dense crowd and the inability to get drinks. But I highly recommend this place for anyone visiting Nashville. It is a classic place. Nashville. 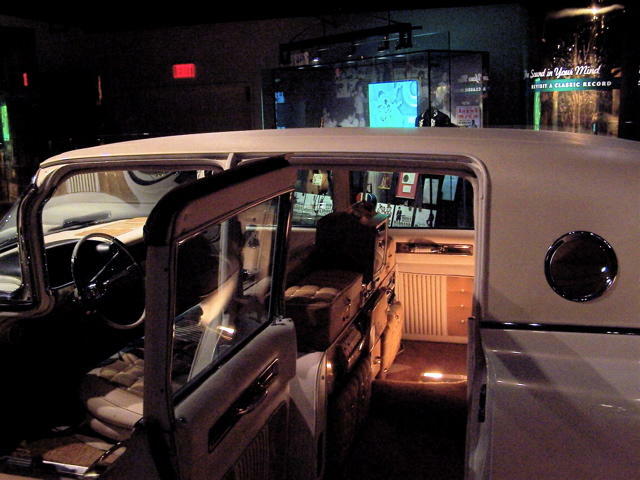 Home to a virtual plethora of country music stars, bars, and terrific entertainment options. Most things went smoothly, with a very quick trip through the new Southwest Terminal at BWI airport; they've done a very nice job and the shopping mall is pretty decent. Security took but a few moments, or at least should have. My number came up for the more thorough search. I have to say that the TSA person was very courteous and respectful. The flight was on time and also went pretty well. That is, until I waited at baggage claim for our one suitcase. The Southwest representative said that a security scanner back in Baltimore had problems and some bags didn't make it. Oh, well. The hotel, the Hilton Downtown Nashville, was about 20 minutes from the airport and it was a flat $22 taxi fair, which actually made it cheaper than the shuttle bus! We were pretty early so there was no room at the inn (been waiting to say that). Left our bags with the bell desk and hit the streets. The Hilton is next to the Gaylord Center and in front of the Country Music Hall of Fame, and only a block from the entertainment district of Broadway, so it has a great central location. Most food places were just opening up and activity downtown was pretty minimal. We wandered Broadway towards the river, then up 2nd Ave next to the Hard Rock and past the Wild Horse Saloon, stopping into Willie Nelson's museum shop on the way. Charlie Daniels also has a museum and shop just a few doors down. We found ourselves in front of the San Antonio Grill. An interesting place with pretty good Tex-Mex grub. Washing down my hot wings and taco with a cold Corona definitely put me in the vacation mood. On our way back to the hotel, we stopped in Gruhns Guitars and then into the Stage on Broadway. Another real cold beer while taking in the lone entertainer on the stage felt perfect. A few shops later we were back at the Hilton and our room, I mean suite, was ready. Time for a nap. Look forward to more posts folks because I'm a-goin' to Nashville, TN. The capital of country music and home to the Grand Ol' Opry. 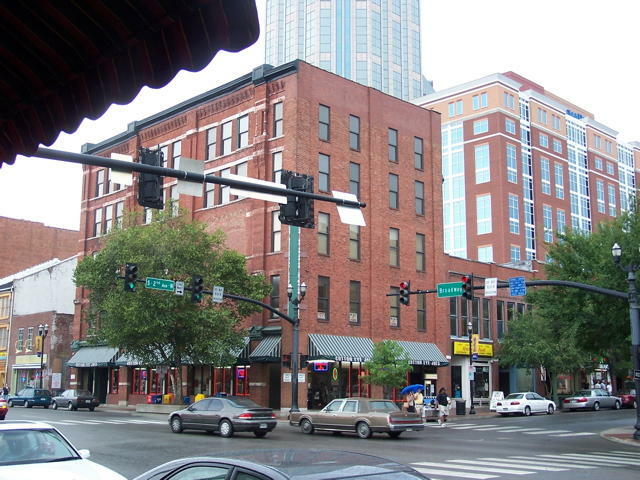 A last minute trip, we're staying in the Hilton downtown for a great rate, and within walking distance of Music Row and most of the city attractions. 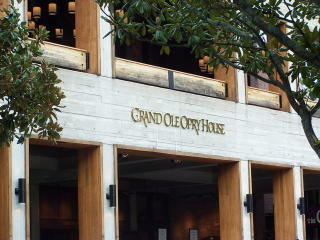 We also have tickets to the Opry on Saturday, so keep an eye out here for the details. Well, my travels are on pause. That is, except for my short travels to the hospital where my father is at. I am sure there will be more adventures shortly and there will certainly be more musings on the travel experience. So, hang in there!